Be sure to stop by the small visitor center (May-October) to browse the bookstore and learn more about the nature and history of this special area. 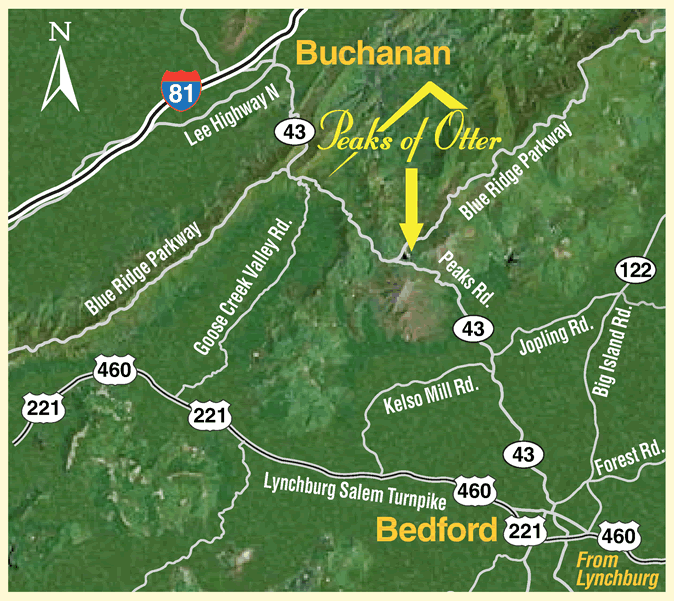 You may be surprised to learn just how long people have sought out the Peaks of Otter as a sylvan retreat, and just how rich the forests and fields are in plants and wildlife. Check the bulletin board for the schedule of Ranger-led walks and talks that are offered in summer and early fall. Maps of the Parkway and nearby trails are available free. Peaks is a great place to hike. Trails meander up Flat Top and Sharp Top mountains and cross Harkening Hill. Nearby take the Fallingwater Cascades Trail, a 1.6-mile loop, through forest and rock outcrops to a scenic cascade. Unfortunately, a tiny non-native insect, the hemlock wooly adelgid, is taking a dreadful toll on these moisture-loving evergreens, but the trees are still a delight throughout the Peaks area. The surrounding eastern hardwood forests are mostly mature and some trees are impressively large. Don’t overlook the surprisingly varied species of smaller plants, including the delicate spring wildflowers. A loop trail of approximately two miles will take you to the Johnson Farm, which was built in the 1850s and was home to several generations of that family. The refurnished house is open in summer and living history demonstrations are given when volunteers or park staff is available. Allow two to three hours for the walk and visit. For a lazy-day activity, wet a line in Abbott Lake. The fishing isn’t always good, but the setting makes it hard to complain. Elevation changes make these trails more difficult than their mileage would suggest. Take water and allow plenty of time. Less energetic sorts might prefer to stroll around Abbott Lake or to take the shuttle bus (seasonal, fee) up Sharp Top. A short walk is required from the bus stop near the summit, but the distant views of the Virginia piedmont and the adjoining national forest are ample reward. Deer are everywhere. Some appear tame, but they are not. Avoid the temptation to feed them. Take Virginia Route 43 east 10 miles to Bedford, Virginia, home of the National D-Day Memorial. The descent from the mountain passes rural farms and leads to the historic town, which still has the look and feel of a bygone era.